Fig. 8.3. 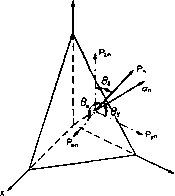 The state of stress on an inclined plane through any given point in a three-dimensional cartesian stress system. ABC and YZ are given by the angle between the normals to both planes n and x, etc.) For convenience, let the plane ABC initially be some perpendicular distance h from Q so that the cartesian stress components actually acting at Q can be shown on the sides of the tetrahdedron element ABCQ so formed (Fig. 8.3). In the derivation below the value of h will be reduced to zero so that the equations obtained will relate to the condition when ABC passes through Q. Fig. 8.4. Normal, shear and resultant stresses on the plane ABC. I2 + m2 + n2 = 1 and (I')2 + (mf + (n')2 = 1 Equations (8.1), (8.2) and (8.3) may now be written in two alternative ways. In each of the above equations the first suffix is common throughout, the second suffix on the right-hand-side terms are in the order x, y, z throughout, and in each case the cosine term relates to the second suffix. These points should aid memorisation of the equations. Memory is again aided by the notes above, but in this case it is the direction cosines, I, m and n which relate to the appropriate second suffices x, y and z. 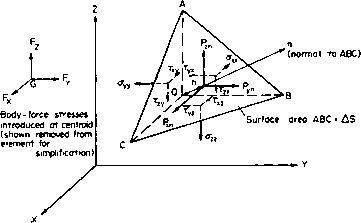 Thus, provided that the direction cosines of a plane are known, together with the cartesian stress components at some point Q on the plane, the direct, normal and shear stresses on the plane at Q may be determined using, firstly, eqns. (8.13-15) and, subsequently, eqns. (8.4-6). Alternatively the procedure may be carried out graphically as will be shown in §8.9. 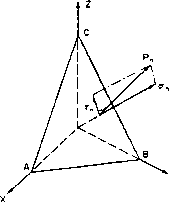 Consider again the oblique plane ABC having direction cosines /, m and n, i.e. 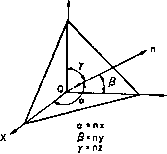 these are the cosines of the angle between the normal to plane and the x, y, z directions. 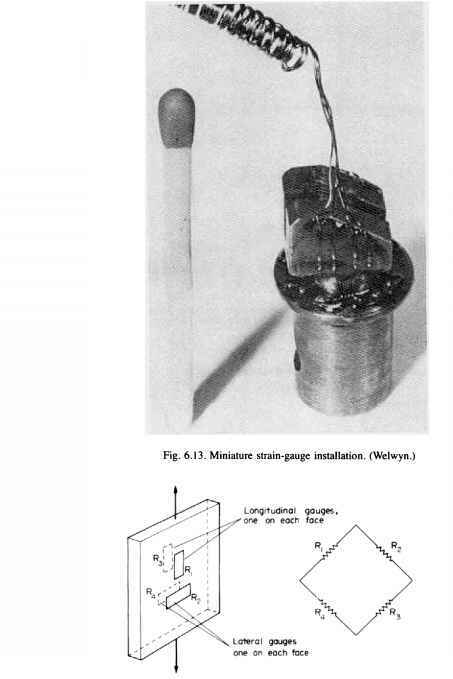 In general, the resultant stress on the plane p„ will not be normal to the plane and it can therefore be resolved into two alternative sets of components. (a) In the co-ordinate directions giving components pxn, pyn and pzn, as shown in Fig. 8.5, with values given by eqns. (8.13), (8.14) and (8.15). (b) Normal and tangential to the plane as shown in Fig. 8.6, giving components, of an (normal or direct stress) and r„ (shear stress) with values given by eqns. (8.5) and (8.6). Fig. 8.6. 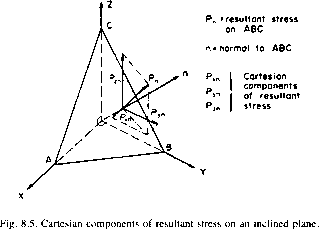 Normal and tangential components of resultant stress on an inclined plane. As stated above, the resultant stress pn is generally not normal to the plane ABC but inclined to the x, y and z axes at angles 6X, 6V and 0Z - see Fig. 8.7. Fig. 8.7. Line of action of resultant stress.